The beauty of the Ninja Master Prep Professional Blender is that it is high-powered, but comes at a price that you can easily afford. Making use of its 450 W of power, it can easily plough through any kitchen processing needs such as crushing ice, puréeing, making smoothies and blending to name a few. 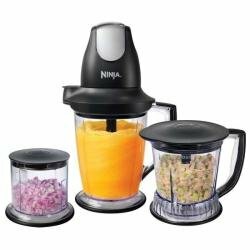 The Ninja Master Prep is a great blender with so many uses, and you can find great reviews of it online – for example, of the 52 people who have so far left a review on Amazon, 30 gave it the full five stars and 9 gave it four stars – a few people gave it lower ratings, but we will come onto the reasons for this later. If you’re thinking about getting the blender, but still unsure if you’re making a wise decision, then continue reading the article. What Are You Getting From The Ninja Master Prep Package? The Ninja Master Prep comes with an interchangeable Master pod that works on its 48 ounce pitcher and 16 ounce bowl, and don’t forget about its patented 6 stainless blade that can be used for blending, chopping and crushing ice. Right now, it is available for a great discount from Amazon. The blender comes with a pulse option with three fixed speed settings. The fix speed settings are great for mixing, blending and ice crushing, while the pulse is great for controlled processing and chopping. On top of that, the components of the ninja prep, such as the blade, lid and pitcher, are dishwasher safe. If you prefer not to use the dishwasher when it comes to cleaning the blender, you can easily fill the container with warm water of up to 3/4th of its full capacity, and then push the pulse button several times. Empty the container and it is now easy to just wash and rinse by hand in the sink and then leave it to drain. What Can You Exactly Do With Ninja Master Prep Professional? 4. nothing gets wasted – because you can remove the blade it’s really easy to scoop out all the goodness. The things that you can do while using this powerful blender are almost limitless. You can easily make delicious smoothies from fresh or frozen fruits. Sorbets and ice cream are also a possibility. You can also use the blender in chopping fruits and vegetables, and grinding nuts. On top of that, you can make hummus, gazpacho and even make your own breadcrumbs for cooking purposes. On the other hand, you CANNOT make use of the Ninja Master Prep for mixing dough. Low scoring reviews came mainly from people who cut themselves on the blades. Beware, these are very sharp, but if you follow the safety instructions carefully, you should not experience problems. The Master Prep is known for blending smoothies. This is because the whole blending system revolves around its six blades. For best results in making smoothies. Start up with the speed three setting to roughly chop your chosen ingredients. Then you can proceed to using the pulse button, then mix your smoothie well with a spoon, and then hit the pulse button again. You can do this as many times as you want until you get your desired smoothie consistency. If you are having difficulties in making smoothies with this blender, (like a few of the low-scoring reviewers), most of the time the blender is not the cause of the problem. People who are not experienced in making smoothies seldom use sufficient liquid or water in the mix. In the process of making smoothies, you must add enough liquids so that the ingredients will move around freely, and get blended well in the process. Once you have learned to master this technique, then you will have no problems in making satisfying and delicious smoothies with your Ninja Master Prep Professional Blender.